I’ve only watched The Simpsons a few times in my life, but I vividly recall an episode where Homer stands in front of his bathroom mirror shaving. As soon as he puts down the razor and towels his face dry, his six-o-clock shadow emerges as gray and shady as it was before he began. I mention this here because I, like most parents, contend with my own Homer’s Beard every day, i.e. the clutter…i.e. the beading kits, the book order catalogs, the cheese stick wrappers, the Monopoly money, the paper dolls, the general detrius of family life, which keeps coming back bigger and stronger and darker and shadier no matter how forcefully I fight it. Like it’s freaking alive. It’s not even like my kids are that messy — they’re just busy and into things. And when you’re busy and into things and you are not yet paying you’re own rent…well, it would take some convincing to get me to clean up the wikki stix too. The Sisyphean struggle is annoying every day, but it is particularly annoying every other Wednesday when the house is professionally cleaned, the sink scoured, the floors mopped, and the stovetop is sparkling in the sunlight with nary a grease speck in sight. I devote my whole being to protecting the illusion of a peaceful, orderly house as long as possible…which usually amounts to about 20 minutes. My friend Frances, who attempts this feat of daring as well, has managed to carve out an oasis of calm in the one spot her young kids are not allowed to touch: the stovetop. On cleaning day, she makes baked sausages because it’s all done inside the oven, involves minimal countertop work, and keeps the stovetop area clean and mess-free. For one night at least. I originally thought this might work as a one-dish and a no-chop meal, which is why I bought tiny potatoes and cippolini onions. But it can be annoying to peel those tiny onions (no matter how sweet the reward) so you should feel free to use a regular onion. Preheat oven to 425°F. In a large baking dish, toss 2 cups small whole unpeeled potatoes (or 3 to 4 medium potatoes chopped), 1 medium onion (chopped artlessly in chunks), and leaves from 2 sprigs of fresh thyme with olive oil, salt, and pepper. 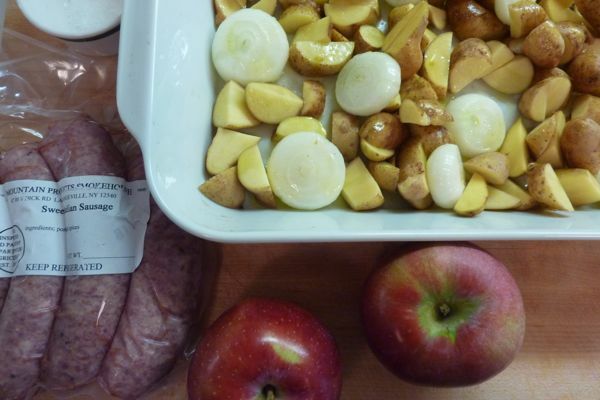 Bake for 20 minutes, then toss in 2 to 3 apples (unpeeled, preferably baking apples such as Cortland, Granny Smith, Jonathan, Northern Spy) that have been cut into large chunks, and 4 uncooked sweet Italian sausages (about 1 pound). Turn heat down to 400°F and bake another 30 minutes. During the last 5 minutes of cooking, stir 2 tablespoons of cider vinegar into vegetables. Serve with dollops of grainy or Dijon mustard. The out-of-control beard is the PERFECT metaphor. I was thinking to myself last night that all I seem to do is move piles of stuff around. Stuff piles up, you move it back to where it belongs, and when you turn around again another pile is already growing, like some kind of evil fungus. I’m a neat freak. I live with a not so concerned husband, our 5 year old daughter (a.k.a the hoarder), and 3 constantly shedding pugs. Mess = stress. I can feel my blood pressure rise when I look around our den. Thank goodness for Caillou, the very unassuming betta fish. His messes are self-contained! Anyway, I can completely relate to the “can we keep the freshly cleaned house clean for maybe 5 minutes please?” feeling. I also have an every other Wednesday cleaning lady and it would be awesome to keep my stovetop pristine for more than a moment after I walk in the door from work! I could not agree more–such a perfect metaphor! Sometimes I become immune to the rash of art projects, book orders, paper airplanes, etc…and then we find out company’s on their way and I suddenly realize that every piece of paper and stray sock had multiplied. Ugh. Love the one-dish idea. My crazy-for-sausage kids and husband would adore it! I just took some chicken sausage out of the freezer and wondered what to do with it tonight. Now I know! Thanks for another usable idea. Sometimes I swear we are cut from the same cloth, Jenny. However, on the days when our housekeeper comes and does her magic on the house we go out to eat that night so the cleanliness is enshrined and preserved for at least 24 hours. But I do love one dish dinners and my son would swoon over the combo of apples and sausages. I might have to break us of the restaurant outing on cleaning days (it is revered much like Friday Pizza nights in our house). We call the evening detritus cleaning-up, making “Adult World”… it’s kind of like “T-Shirt Time”. Tonight is my cleaning lady day so I will try this tonight. It is also a very busy day, but I can have this prepped and ready to shove in the oven at the last minute. Perfect! One of my two loved the shrimp and angel hair. I consider that a huge success. The other child, well, God love her, ended up eating an entire raw red pepper that night (her preference). I made something very similar to this recently which was delicious, and a big hit with my 2-year old son and my husband. It had chopped sage leaves and cannellini beans (white beans) instead of potatoes. Being of Irish extraction, I would have no trouble with putting in both beans and potatoes, and I would still be very very happy. i’ve never had a cleaning person come to my house for this very reason–the weekly setup for nearly immediate heartbreak (and i need that like i need more cat litter scattered everywhere on the floor!). even without a cleaning person, i am so making this dish. I’m so making this tonight. And probably going to be thinking about it for the rest of the day. That sounds like perfection, if you ask me. My very own copy of Time for Dinner arrived in the mail today….early Christmas present for me….wheeeee! Can’t wait to break it in! Your post was so spot on. Today was our cleaning day and not more than 5 minutes after the kids were home there were piles of papers, shoes, lunch boxes and halloween costumes everywhere. Thanks for a new recipe and to confirm that the detrius doesn’t just live here. I am a big fan of these types of dishes….this would be a great Friday night meal for company as well…thanks for the idea! I made this last night. It was really easy and tasted great. I’ll definitely make this again. This is tonight’s meal after I clear the house of weekend clutter! We’re not alone! In the oven now! Thanks! Made this last night and my super-picky 4 year old (1) did not say “yuck” when he saw it on his plate, and (2) ate most of it. So thank you for a great and tasty recipe. I’m new to your site and love it! I am the cleaning lady at my house so you better believe when that stovetop is clean nobody is getting near it for any reason on the planet. The sausage bake sounds like something my husband would absolutely love. So simple jet so delicious. It’s already sitting in the owen! I’ll let you know, though judged by the smell… it’s gonna be delicious. Great idea, I’m always looking for one-pot dinners. The less washing up the better I say! I suggest 5 mins before end of cooking, add handful of sliced prunes and dried apricots, softened for ten mins in a little water. I use balsamic vinegar, a few glugs into the pan, and strew basil and parsley on it. Adds a great deal of specialness. This is so delightfully comforting. A few months ago, I went to one of the best places to eat in New York and they served up authentic British fare. This is very similar and I love it! 🙂 Thank you! I made this dish this evening. It was easy to make, and delicious to eat. Wifey liked it, too. I threw in a couple of extra sausages, and it will be great leftovers for tomorrow. What sausage is in that photo? Is it the Italian one you mentioned? It looks just like the butifarrita I buy. I had tried a similar recipe using yams, apples, and butiffarita that I got out of a $1 Amish Casserole Cookbook. So good! Can I suggest an addition to this recipe? Thank you for sharing the recipe. We cook variations of this recipe quite a few times a month. We made this last week and it was delicious. We had some leftovers and the rest of the week’s dinners accounted for, so I decided to chop up the leftover sausages, onions, potatoes, and apples, and baked them with some eggs, milk, salt, and pepper into delicious egg muffins. Trying this tonight! I’m curious though — this looks very similar to the recipe in your DALS cookbook on p. 109, but the baking times are a little different. I’m sort of doing a cross between the two instructions (online and book) and hoping for the best! Do you prefer one or the other?